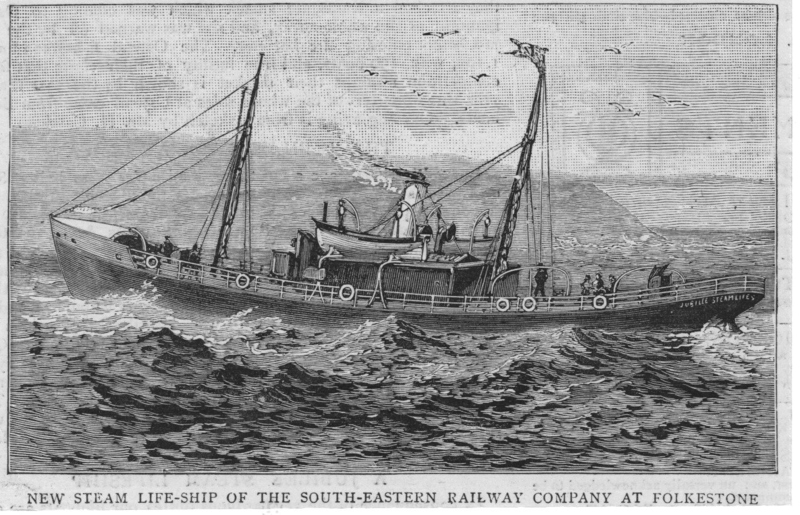 After a tragedy off Dungeness in January 1873 the demand for a steam life-ship to supplement the Rye and Dungeness sailing and pulling life-boats intensified. The Hobart-bound sailing ship Northfleet was at anchor two miles off Dungeness in Hythe Bay on the night of 22nd January 1873 when she was run down by the Spanish steamer Murillo which was showing no lights, and which made off down-channel after the ramming. Besides a cargo of railway iron the Northfleet was carrying more than 400 emigrants, some of them women and children, of whom some 350 were drowned. Sir Edward Watkin, Chairman of the South Eastern Railway Company, wrote to ‘The Times’ appealing for the government to establish a life-ship for cruising off Dungeness, but nothing came of the idea. Just over five years later in May 1878, a further tragedy occurred near the same place when two German warships Grosser Kurfurst and Koening Wilhelm were in collision. The Grosser Kurfurst sank with the loss of 300 lives, but still nothing was done. In the year 1887, the Golden Jubilee of the reigning Queen, Sir Edward Watkin decided to mark the occasion by having a steam life ship provided by the South Eastern Railway. 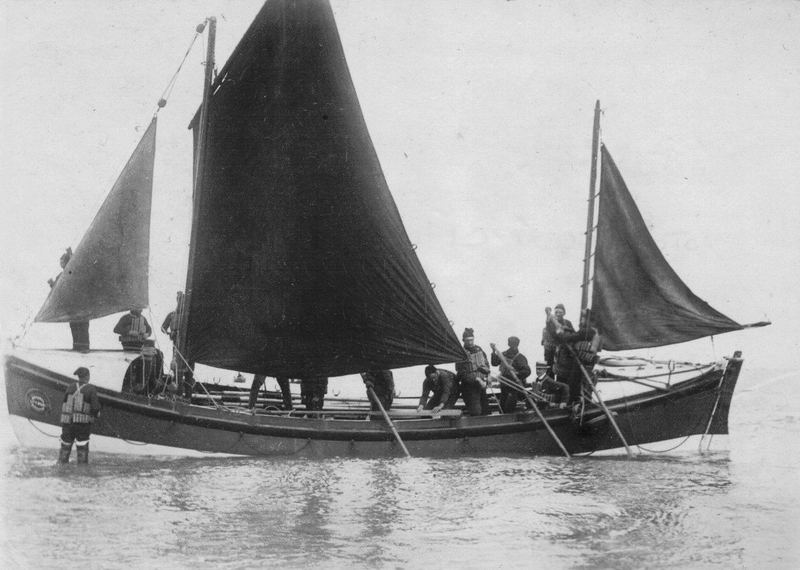 Samuda Bros. of Poplar built this unusual craft, which arrived at Folkestone Harbour on Wednesday July 6th 1887. Her official name was ‘Jubilee Life Saving Ship No.1’, she was 123.5 feet long 20 feet wide and had a tonnage of 141 tons gross. Her life-saving equipment included lifelines and lifebuoys around her rails and a ‘resuscitation cabin’ containing a large bath with hot waster laid on. The Jubilee was never called upon to fulfil her primary purpose. There were occasions when she might have done so, had she been afloat or at hand and not in Boulogne loading perishable goods. Twelve years later, soon after the formation of the South Eastern & Chatham Railway Company, on 1st January 1899 the Jubilee was sold. Folkestone. At 5am the tow parted and the stricken vessel was swept towards the shore off Brewers Hill, Sandgate. The captain dropped both anchors which halted the drift, but the seas cascaded over the vessel and she began to sink so the crew took to the rigging. Rocket apparatus was at once brought into use by the coastguards, but their efforts failed. In the meantime the Sandgate Lifeboat ‘Meyer de Rothschild’ had been taken upwind to Hythe and was launched about 9.30 am, but she only got a short distance before she turned completely over losing a crew member by the name of Fagg. Attempts with the rocket apparatus carried on all day until the supply of rockets ran out. About 8 pm the wind abated and a volunteer lifeboat crew from Folkestone finally reached the Benvenue; 27 survivors were snatched to safety and taken to Folkestone harbour, where large crowds cheered their arrival. The captain of the Benvenue and an apprentice were both drowned. Just eight days after the disaster a public meeting was held at the Folkestone Town Hall. A lifeboat committee was formed in accordance with the wishes of the local residents, the Chairman elected was Councillor Stephen Penfold. 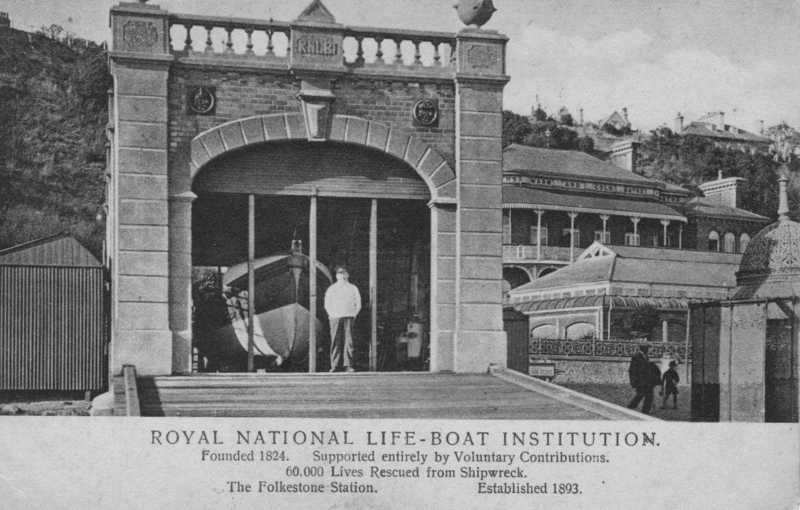 Early in 1892 the Royal National Lifeboat Institution decided to form a lifeboat station at Folkestone and move the Seabrook station to Hythe. The Folkestone Lifeboat House was built opposite the Bathing Establishment just east of the Leas Lift. Tenders were received in July from eight local builders, the tender from Hayward and Paramor was accepted for £659. 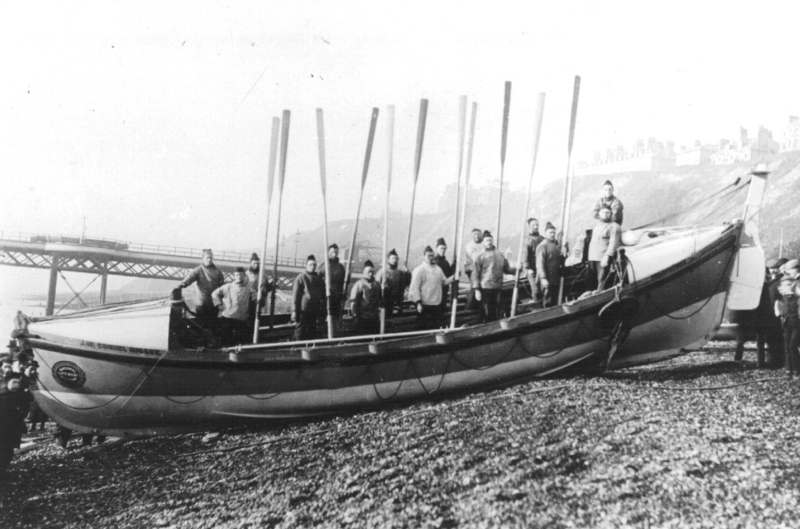 The lifeboat provided was 38 feet long 8 feet wide and rowed 12 oars double banked; it was to be fitted with three water-ballast tanks, provided with plugs and pumps by means of which water could be readily admitted or pumped out, it was also in possession of the latest improvements in the way of self-righting, self-ejecting water etc. Like all the modern self-righting lifeboats this boat will promptly self-right if capsized with all the crew and gear in, masts up and sails set. It was furnished with a transporting and loading carriage. The cost of the boat, carriage and equipment £900 was defrayed by Miss Curling of Denmark Hill, London and as desired by her, it was named the ‘J McConnel Hussey.’ Her official number was 343 and she was built by William T. Ellis of Lowestoft. The boat arrived in December 1893 and the formal inauguration of the lifeboat establishment took place on 25th July 1894. The J. McConnel Hussey was stationed at Folkestone from December 1893 to March 1903 in which time she made four launches and saved ten lives. 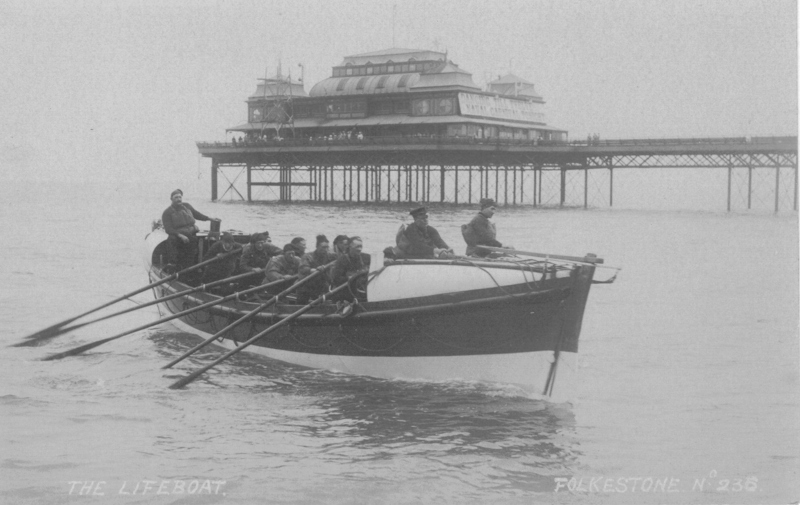 In March 1903 Folkestone received its second lifeboat the ‘Leslie’. She was built at Thames Iron Works (Blackwall), her official number was 508. 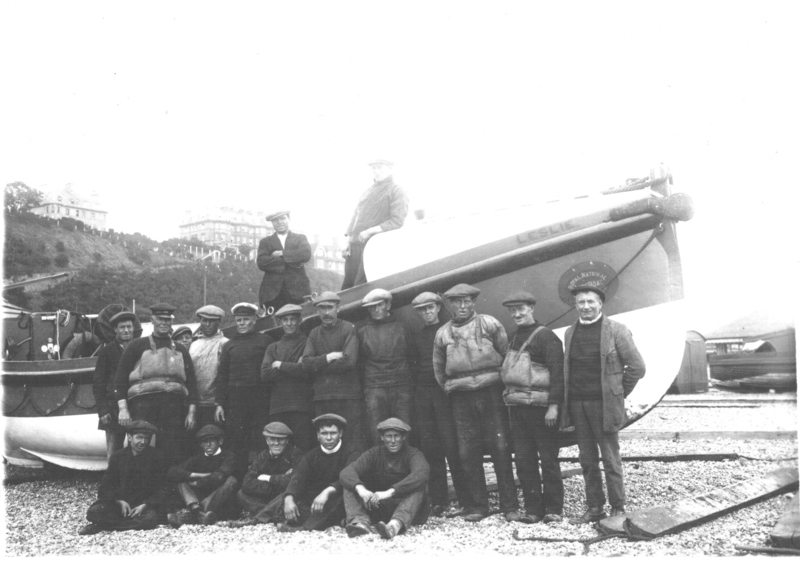 The building of the vessel was funded by a legacy from Miss K. S. Skinner of Brighton. She was another pulling and sailing boat 35 feet long with a 8 feet 6 inch beam, she was fitted with a centre board and rowed 10 oars. From 1903 until the station closed in 1930 the Leslie was launched on service 21 times saving 16 lives. Folkestone was going to have a new motor lifeboat provided and partly maintained by the City of Nottingham and named after the City. But by the time the boat was ready the lifeboat institution had decided to station the boat at Hythe and close the Folkestone station, this was due to a number of reasons. Dover had a new motor lifeboat in January 1930, also Dungeness had a motor lifeboat, these boats had a greater range than the old sailing and pulling boats. This meant two stations between Dover and Dungeness were not necessary. The second reason being the Folkestone station could not be used one hour before low water until one hour after low water, this was due to the obstruction caused by the Church Rocks. The City of Nottingham arrived at Hythe on 11th January 1930 and the Folkestone station closed as a service station on 16th October 1930. 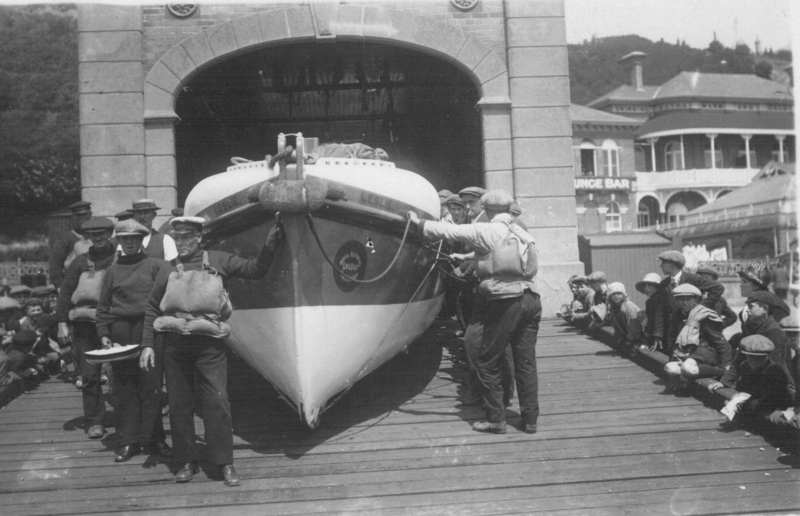 The lifeboat at Folkestone remained on exhibition in the boathouse until 7th May 1936 when the boathouse was surrendered to the landlords agent and later demolished.